Here’s a good news story for a change. New Zealand seniors are forming Coffin Clubs to build their own coffins, adding their personal style with paint and other decorations for when the time comes when they might need to use it. The do-it-yourself movement began in 2010, started by a palliative care nurse, Katie Williams, in a makeshift workshop in her garage in Rotorua, on the North Island. She got some volunteer handymen to help local seniors build their own coffins — they are made from particleboard kits and are shaped like traditional caskets or as rectangles. “Because of my work and my age I had become a perpetual mourner,” Williams told The Guardian newspaper. 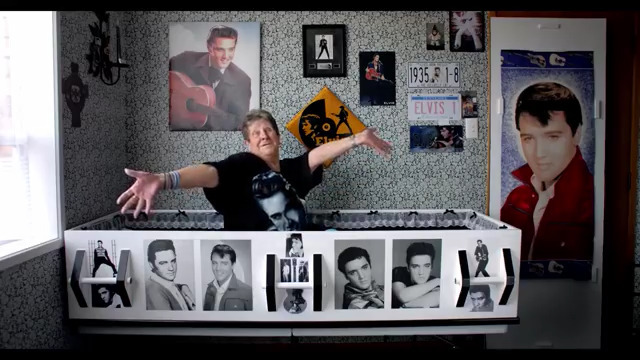 “I’m going down with Elvis,” says this Coffin Club member. There are now more than a dozen coffin clubs in New Zealand. Seniors found it was fun painting and decorating their own coffins and a great way for many lonely seniors to socialize with others in the same age group, many of whom had loved one pass away. “We like to say it is only a box until you put someone in it,” one woman told the New York Times in a story published earlier this year. The boxes can also double as furniture at home — one woman uses hers as a seating area with cushions. The coffin kits cost about $170, much less than what a funeral home charges for a coffin of similar quality. Club membership ranges from $7 to $17 a year. This entry was posted in A good news story about death. Bookmark the permalink.